Residential, Business Removals & Packing Blackfen and Lamorbey SE9 | Quality Property Care Ltd.
Do you have to move out of your appartement really quickly and move into your new one asap? Save time, effort and a lot of problems by booking the professional removal services in Blackfen and Lamorbey SE9 offered by Quality Property Care Ltd.. The skilled, qualified and reliable team can help you with every phase of the moving out and moving in procedure, including: disassembly and dismantling of your furniture, packing, transporting, loading, unloading, installing and unpacking and assembling everything back in the new location. The company offers the top and most effective removals services at the top competitive removals price in London. The removal company provides residential and commercial removals which you can rely on. Save the energy and efforts and call the expert removals company on the phone line or contact them via the online web form, and you will get a free quote for the service you want now! Quality Property Care Ltd. qualified removals in Blackfen and Lamorbey SE9 come as a rescue in a rush situation. We are ready for same-day or emergency bookings. We work 365 days per year - with no exception for holidays or weekends. Dear clients, we can assist you either with partial of your removal chores and with the whole removal process! Our removal company in Blackfen and Lamorbey SE9 has a specially customized checklist to follow in order to arrange the process in a optimal and precise way. If you have your own demands and inquiries, do not hesitate to notify our insured, experienced and well-tailored men with van in time. Quality Property Care Ltd. is your reliable removals company, when it comes to home removals, man with a van collection & delivery / Item Pickup, office removals, commercial removals , art transportation. We provide a TOTALLY risk-free, speedy and efficient removals services on a budget. Our procedure is never to leave the property without ensuring that everything is completed. All the removal specialists are insured, skilled, well-trained and informed in the sphere. Do not worry to leave them keys to your house to ensure they will load or pack the baggage, while you are out to deal with other responsibilities you have on your mind. Professional removal in Blackfen and Lamorbey SE9 is always the better option for you to save time and money! This is a service appropriate for the loading, transpiration and unloading of smaller sized things and boxes. You hire a man with a van and you yourself package and unload the things, we only deliver the van and a driver who can support with lighter loads. This is also suitable for Ebay and IKEA pickups or for package pickups and deliveries all around the Greater London area. This is a completely guaranteed service, sending out only 1 man with a van, it’s a flexible for booking, good for last minute jobs. Our specialists are local and trained, with vans equipped with all of the needed items to make your move easier, including a ramp. Generally we can move pretty much all sorts of things from inside a home, from beds, to boxes, to kitchen appliances like dining sets, sofas, washers, TV’s, shelving, queen sized mattresses, double beds, three wing cupboards and dressers, fridges, bikes, pianos and quite a lot more. As long as the things are very easy to access we can move them at any place you want, simply call us. Along with that we are also providing you a packaging service, we arrive and package everything for you. If you like to do it yourself but lack the materials and boxes, give us a call and we can drop some off at your place. In the standard service are integrated the pickup and delivery of loads from one place to another. We can then move the items inside of the new place or simply unload them and leave you to deal with it yourself. Art and business furniture take special care to be handled, for this reason we have a unique service which handles both paintings, statues and art works, and workplace equipment, pianos and so forth. To arrange a correct removal of office furniture, contact us and request a meeting with one of our representatives. We’ll send a surveyor out who can find out the suitable amount of people and equipment we require in order to properly get rid of everything in one go. After that a quote will be given detailing the cost, in which we include the time, and resources necessary to properly move everything. 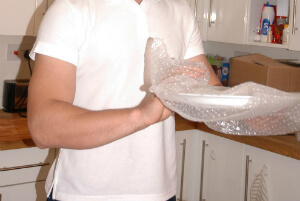 Specific packaging materials can be delivered like electrostatic packaging for computer systems and electronic products and so forth. For paintings, statues, art pieces and pianos we can organise a premium removal van which ensures the safe move of any one of your personal belongings. To book the removals services of the company, you need to call 020 3746 4287 or send an online booking form to the customer care service, and you will get a written confirmation via sms and e-mail asap. The earlier on you book your removal service, the better offer you will get. Absolutely no deposit is required for booking. All you must do is organise a parking space for the removals vehicle and have someone on the spot at the date and time of the booking.